Love getting to know other people? Love having a fun time? Then WeFiFo is the supperclub that you really need to try out as they truly are one of the best in the UK. WeFiFo connects home chefs, supper club hosts and event organisers with hungry people. Cook – you can host an event at WeFiFo. Whether it’s dinner at your kitchen table to a brunch on a barge. All you have to do is post your event on WeFiFo. It could be that you are hosting a event for friends, for charity, to earn some extra pocket money or even to launch a career. Eat – if you are looking for a truly unique and affordable eating experience then think WeFiFo! Simply search by location or scroll through the featured events and reserve your seat at a table that takes your fancy. Earn – WeFiFo offers a great opportunity for aspiring cooks to achieve financial independence but WeFiFo also likes to reward hosts, guests and community spirit with cookies, their online rewards. Cookies you can spend n attending events, acquiring new skills or on unique WeFiFo merchandise. Share – at the heart of WeFiFo is a desire to share. They want people to share their talent with the world by hosting an event and by bringing people together to share food, stories and laughter. After any event, guests and hosts can review. To see all the latest supperclubs that you can book with WeFiFo then click here. Thanks to WeFiFo who let some members of the community of Love Pop Ups London come down to experience several of their supperclub events. Read all blogs/reviews from the comments section below. Being a huge foodie, I was more than thrilled to trialand to see what it’s all about. One of the founders, Jon, was nice enough to chat me through the site and where the idea came from. Basically, it’s best described as the Airbnb of the dinner table. Inspired by the fact that some people go night after night eating alone, they can now invite others into their home to share a dinner at a small cost. Booking using the site was super easy, you can log in via your Facebook account (or an email), and then you’re asked about some of your interests related to food and eating. It was painless. From here you can search for events in your area. I went to two, both had completely different menus and venues, but we similar in that the food was great and my fellow diners were friendly at both. To read more on the various supperclubs I experience go to my blog page. I love food and was thrilled to be invited by Love Pop Ups London to a WeFiFo Indian supper club dining event. I was really looking forward to this event, firstly to taste really good Indian food, and secondly, a chance to see firsthand how this supper club works, and not least, I must admit, an opportunity to meet Reza Mahammad, a celebrity chef, and have him cook a meal for me, seems pretty awesome. I must also admit here that I do not have much experience with Indian food, so this will be an interesting experience for me. So we arrived at the venue, which turned out to be Reza’s friend’s beautiful home, where he will entertain us in the way only Reza can. We were greeted by a lovely smell of cooking wafting from the kitchen. We settled in the front room and were offered a welcome drink, while we await the other guests. As we drank, I also tasted for the first time little delicious parcels of Pani Puri, fried puff dough balls which was filled with goats cheese, chutney and sprinkled with crisp noodles. Reza told us he lined the Puri with lettuce leaves to stop it getting soggy from the wet filling. We all agreed that they were very tasty pre-dinner nibbles. While we made our own introductions with the attending guests, and our conversations flowed smoothly and naturally, Reza was in the kitchen preparing our supper. When all guests had arrived, we were shown into the dining room and dinner was served. We started off with Sweet Potato & Goats Cheese Samosas with a Tomato Ginger Chutney, followed by large dishes of food placed in the centre of the table and everyone helped themselves, family style. These were Lamb Koftas that were soft and tender, in a rich savoury yoghurt sauce with lots of almonds, served with the light fragrance of Saffron Vermicelli Rice, Broad Beans with Yoghurt, Tahini and Chilli Butter, Lentils with Spinach and Coconut Milk. All very enjoyable and delicious. I especially liked the broad beans, as there was a nice scrunch from the little fried pitta bread, that topped the dish. The food was plentiful, and very soon our bellies were too full, but Reza still had one more course to delight us. We finished with a dessert of berries and white chocolate panna cotta, with rose syrup, a really nice, fresh and not sweet end to quite a rich main course full of flavoursome sauces. I agreed with Reza that this was a nicer dessert to end with, than with Indian sweets which would be a too sweet ending. The meal was very tasty and very authentic. The venue was perfect, the table was beautiful, and the atmosphere was warm and homely. It was like having dinner with one big happy family. Reza is a marvellous host, talking about the food he was serving, what ingredients were used and how he cooked them. He even divulged his recipes and cooking tips. I now wish I had taped it all, as there were so many tips intermingled with the lively conversation. He is so knowledgeable and inspirational. He entertained us with everything from art to history to music and so on, not just about food. What a great way to spend a Saturday night sharing good food with amazing guests, by the end of the evening, no longer strangers. It was a very lively evening indeed, with lots of laughter. The time flew and it was time to go, although it was very hard to, as we all were enjoying the evening so much. Reza joked that we could stay until breakfast! The WeFiFo booking process is really straightforward. Once you have registered with WeFiFo, you simply choose an event you want to attend and pay using “cookies”, they like rewards, which you can accumulate quite quickly via different activities in the WeFiFo community, for example, either hosting or attending an event. To start you off, just by registering you will have earned five cookies. However, after the booking is made, you do have to wait in anticipation for your host to accept you, but what a joy when you do receive an email that says, congratulations the host has confirmed your seat! Two days before the event you are sent a reminder, with event details, dress code, house rules, and drinks code. Then on the day, just relax and enjoy! Thank you very much to Love Pop Ups London for the invite. WeFiFo is a brilliant idea, if you love good food, either cooking, eating or sharing it, meeting people and looking for amazing foodie experiences. Why eat alone, when you can join in with the fun, interesting and entertaining WeFiFo dining events. WeFiFo is a fantastic new concept, creating a platform for those who like to share their cooking (and earn a bit of cash) with those who enjoy trying new food or need some company at dinner. I was lucky enough to be home with my parents on the same weekend they were holding a book and supper club at John & Seni’s house (a 10 minute drive!). My mum and I arrived at the most beautiful home in a stunning setting and were immediately made at home by the attentive, welcoming hosts. A generous amount of prosecco, soft drinks and nibbles were available as we mingled before the book readings. We were then sat in the most apt room (their library) as we listened to 2 authors reading a snippet from their newest novels and then finishing with a Q&A session. The two authors, although different in style and genre, were linked by their stories from the World Wars and it was fascinating to hear the story behind each of the novels. A BBQ with a generous amount of good quality meat was then provided which could have been enhanced with salads and breads. It was also a little disappointing that it was advertised as a top chef. The home made ice cream was absolutely outstanding – Seni should definitely sell it (to me!). A massive thank you to Love London pop ups for introducing me to Wefifo and to John & Seni for making us so welcome at the event. This is a new business and community that can only grow – who wouldn’t enjoy experiencing new food and making new friends? For the main course, we were seated downstairs in a rectangular room on a long communal table. Dinner was served in a communal style and when the chicken curry entered the room, it was filled with proper curry aroma. In that moment I knew I was wrong about the chicken curry. It was no normal business. Last night I was lucky enough to attend a French food and wine and art event at Union Canal and Deli in Ladbroke Grove ‘Prudence Chez Union’. I have Joanne Mortlock and her fantastic ‘Love Pop Ups – London’ Facebook group and website ‘Love Pop Ups – London’ to thank for it. Jo ran a competition for the bloggers and reviewers on the Facebook group for 2 places to the French food and wine and art event (furnished by WeFiFo) and I won! 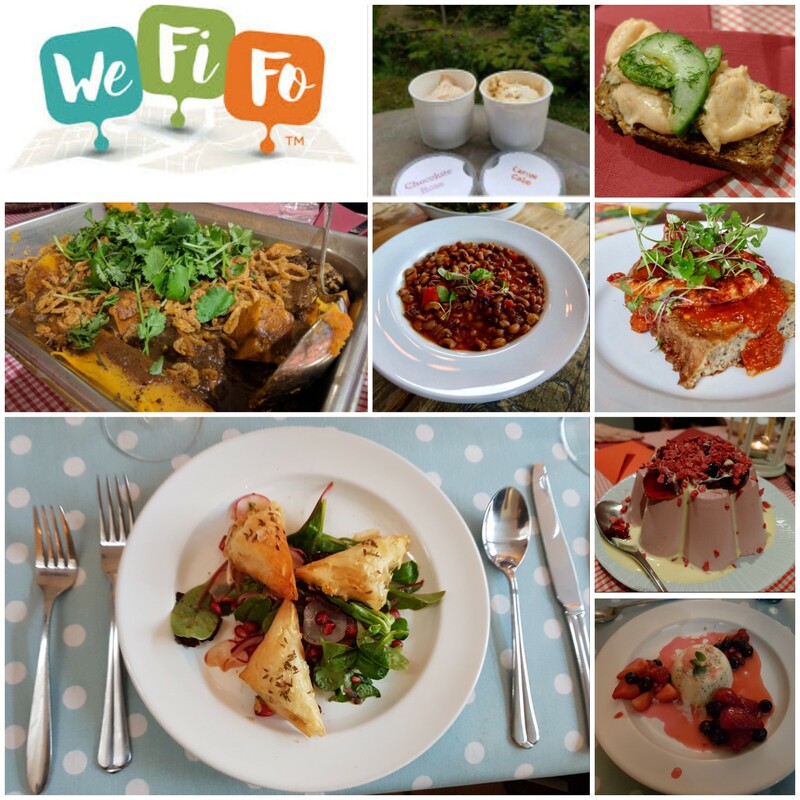 WeFiFo (We Find Food) is a “social eating” platform which allows people to host events and invite people along or as they put it “WeFiFo connects people who love to cook with people who love to eat.” Events happen regularly and all of the place so there’s usually something for everyone. Thanks to Love Pop Ups London, on Sunday evening I got to experience the tantalising skills of Ronnie Murray from Peckham Mannor as part of WeFiFo’s dining experience. WiFiFo organised an amazing event. The staff were friendly and approachable. The food was incredible. It was a lovely touch to have Ronnie come out of the kitchen to explain the reason behind each of the 7 dishes. Recently I went to check out the Om Nom Nom supper club in East London. A beautiful flat with a balcony that we got to enjoy whilst the rain held off. Our hosts Molly and Marie made us feel welcome and amazingly they managed to cook up an amazing feast for 28 of us. Om nom nom is what I’ve dreamed of in a supper club. Friendly hosts, lovely location with a terrace outside and exquisite, well thought out dishes that were restaurant standard. There were so many courses, we were spoilt for chose and it is hard to pick a favourite however particular stand outs were the beetroot and goats cheese canapé, the nduja pork main and the blood orange, chocolate and pecan dessert. Oooo and the beautiful apple, cardamom Prosecco which they generously served. Overall a lovely evening, a massive thank you to Molly and Marie, WeFiFo for creating the platform to organise these supper clubs and Love Pop Ups London for introducing me! This is such a great concept, providing chefs and venues with new opportunities and giving clients new dinning experiences! South London Pop up restaurant hosted by MasterChef contestant Ingrid Wakeling. Four delicious courses, each taking inspiration from different countries and cuisines! Take a look at our latest Vlog, we even got a sneaky peek behind the scenes in the kitchen! A great evening, thank you to WeFiFo and Love Pop Ups – London for the Vlogging opportunity. Entering into the space we were warmly greeted and given a welcome cocktail which was very much needed after making it through one of the snowiest London days in memory. The first room had a comfy couch and nice space to mingle, drink and eat some supplied fried pig’s ears. I’ve actually had these while in Texas a few years ago and these tasted as nice as those- crispy with some sweet spice. If you are based in South London, then you need to check out Ronnie Murray’s supper club at his house (aka Peckham Manor)! I went for the three little pigs supper club and had a fab time. Being literally at Ronnie’s kitchen table made this a very homely friendly supper club, however the food was restaurant quality, so it was more like a chefs table. Poshed-Up Junk Food with Chef Ronnie Murray was my first supper club with WeFiFo and I was very pleasantly surprised by the entire experience. The relaxed atmosphere was lovely and the food was just fantastic! I’ll definitely be back to a WeFiFo event again soon! I adore the cuisine from the Levantine region and I love Yalla Yalla so when the opportunity arose to represent Love Pop-Ups London at their recent supperclub event – of course I jumped at the chance! WeFiFo is a new social eating craze where you simply sign up and you can attend a Come-Dine-With-Me experience in other peoples homes, or if you’re brave enough, you can host your own!